Automobiles are expensive investments that require continuous maintenance. Basic tools and proper knowledge allows a car owner to learn about his/her car, maintain the vehicle, and save more money. 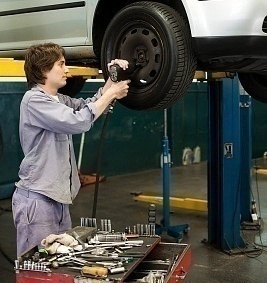 A car’s maintenance becomes more important as it becomes older. Automotive shops can charge an owner sizeable fees for services – some of which may involve simple fixes that could have been done at home, cheap. Described below are some automotive repair tools that every car owner must have. 1. A Jack and Jack Stands – Vehicle owners must have these in the car at all times. A simple procedure such as tire rotation can be accomplished at home using a jack. A jack and a spare tire are helpful for convenient tire replacement in case of a flat tire. In the garage, a jack allows the car owner to reach certain areas under the chassis for purposes of maintenance and small repairs. 2. An Oil Wrench – The oil change is an important part of car maintenance. To make sure that the automobile is in top shape, this procedure should be done from time to time (frequency depending on mileage and other factors). An oil wrench takes off the oil filter, thus allowing expedient oil change at home. 3. A Funnel – A funnel should be used when refilling the vehicle’s oil. This piece of equipment is also useful when other car fluids such as brake fluid, transmission fluid, etc., need to be replenished. The funnel ensures that no wastage or overfill occurs. 4. A Socket Set – For simple engine maintenance, a socket set allows an owner to access spots that could be hard-to-reach. These tools permit the loosening or tightening of a wide range of bolts under the hood. Various extensions in this tool set enable the owner to obtain the angles needed for torque, thus rendering some jobs easier. 5. A Pair of Vise Grips – When some parts are stubborn and will not loosen or tighten properly, a pair of vise grips can come in handy. These tools afford the owner additional leverage to either tighten or loosen a part, such as a nut or bolt. With proper tools and some knowledge, even a non-professional can address minor car problems and maintain the vehicle without resorting to the help of a mechanic. These simple and relatively inexpensive tools can lead to a longer life span for one’s vehicle, as well as larger savings for the car owner.